Beach metal detecting is perhaps one of, if not the most popular place to go metal detecting. This I believe is largely due to the fact that you don’t have to get permission due to the open permit on Crown Estate. It allows those who struggle to find permissions inland to get out there and enjoy the metal detecting hobby whenever they feel like it. Beach metal detecting isn’t in my opinion as fruitful in historical finds as a farmers field, that does not mean however you can’t discover great artefacts and coins. It’s just not as common. I lived in Spain for many years and the beach metal detecting can be very productive in terms of modern jewellery and modern coinage. I decided to write a small guide on beach metal detecting as the process is slightly different to detecting fields and pasture. There are different recovery techniques and you may run into more problems with your metal detector on the beach due to the highly mineralised conditions. Hopefully, you will find everything you need to know on this page, if for whatever reason I haven’t answered a question you may have please leave a message in the comments and I will do my best to get back to you as soon as possible. 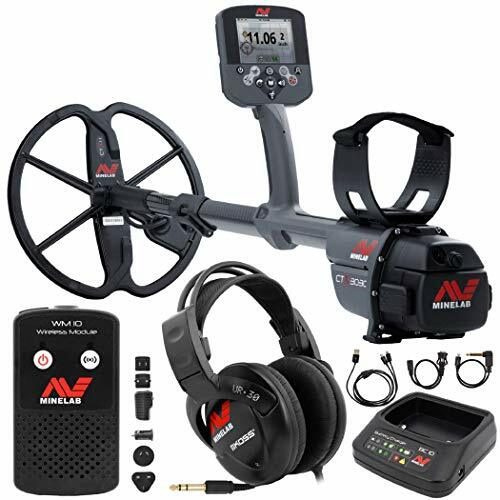 Metal Detector – You’re going to need the right metal detector for the job, many metal detectors just won’t perform well on the wet sand, they give off what they call “ghost” or false signals. This is down to the salt and mineralisation in the water. Your metal detector will react like it has found something but nothing will be there. Very frustrating when this happens. So be sure to check out our best beach metal detectors section if you plan on doing a lot of beach metal detecting. Headphones – Not mandatory but highly recommended especially if you don’t want to annoy others. Not only that having a good set of metal detecting headphones can be the difference between hearing a target and not hearing a target. With a lot of metal detectors in 2018, the headphones will really allow you to hear the difference in ferrous and non-ferrous. Sand-scoop – Although not a mandatory piece of kit, a spade will suffice but if you want your hobby to run smoothly and you would like to recover the found target from the sand with efficiency then you’re going to want a sand-scoop. These come in plastic or alloy and they allow you to scoop the sand below and effectively filter out the sand and leave the target in the scoop. Finds Bag or Pouch – I would highly recommend getting yourself a good finds pouch or bag, this will help you to keep your treasures safe and secure without losing them out of your pockets. I’ve previously written more in-depth about my favourite metal detecting pouches here. Binbag – If you wanted to follow good practice and keep a good reputation for the hobby then taking a bin bag with you would be a great idea, while you’re metal detecting pop any litter you come across in the bin bag and chuck your junk finds in here too. Do you need permission to metal detect on the beach? As mentioned earlier the most appealing thing about beach metal detecting is the open permit. This permit allows you to metal detect on all crown owned beaches without permission. For a full list and map of the beaches, you can metal detect then check out the Crown Estate Foreshore and Estuary Map. You used to have to fill out your email and information online but the Crown decided to just make it open allowing all to go beach metal detecting, providing that they follow the code of practice and the Treasure Act 1996. 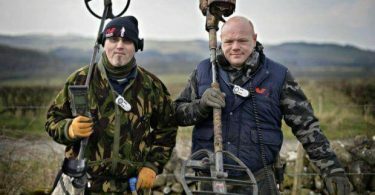 Please check out our beginners guide to metal detecting for more information on the treasure act and its accompanying code of practice. Not all metal detectors are going to be good for beach metal detecting, if you’re thinking of buying something cheap from Maplins and expecting to have a good day finding on the beach you can forget it. It will drive you mad and could even ruin this hobby for you. So I’ve written in my opinion what I believe to be the best beach metal detectors and the ones that perform the best on both wet and dry sand. If you don’t have the budget yet then be patient, save. I promise you saving up for one that performs well is worth it. 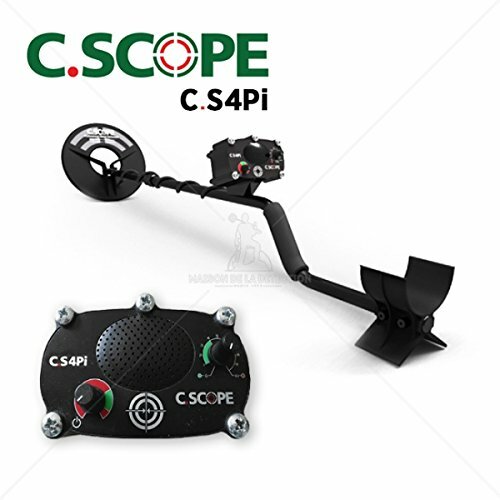 The C-Scope CS4PI is a high sensitivity, pulse induction metal detector designed specifically for the beach metal detectorist. They claim to be unbeatable on wet sand performance and I have to say the reviews confirm this. A great machine if you only want to metal detect the beaches, not so great inland. 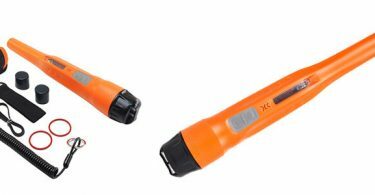 The CS4PI is probably one of the cheapest metal detectors that will actually perform well on a beach. 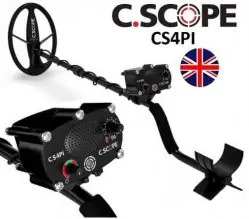 For beach metal detecting the CSCOPE CS4PI is my number 1 recommended detector. I can’t stress enough though this machine is designed for the beach. The following metal detectors are also great beach performers, they are much more expensive than the CSCOPE but then they are also great metal detectors inland, on fields and pasture. The Makro Racer 1 got a good reputation for being a very stable and productive beach machine, so when the Makro Racer 2 was released they knew they had to make it even better and they very much succeeded with a very fairly priced, powerful and stable metal detector on both the beach and land. One of, if not the best all-around metal detector money can buy. As seen in the hit TV show “Detectorists” This machine excels in all ground conditions, it’s also fully waterproof and submersible up to 3 meters. 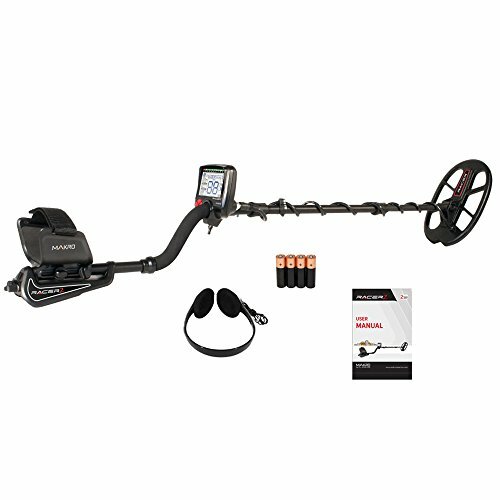 If you’ve got the budget then this is the “Daddy” The Minelab CTX3030 is going to set you back over a grand brand new, but you’ll never need an upgrade again, plus you will be the envy of all your detecting buddies! Lightweight and durable the National Geographic Sand Scoop & Trowel is the perfect plastic sand scoop for metal detecting. If you are unfamiliar how you use one of these, the process is very straightforward. 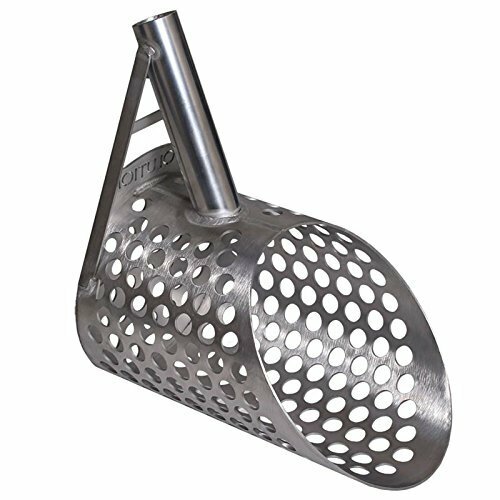 When you hit a target in the sand you scoop the sand up and the small holes in the scoop will allow the sand to pass through, leaving your metal target in the scoop. 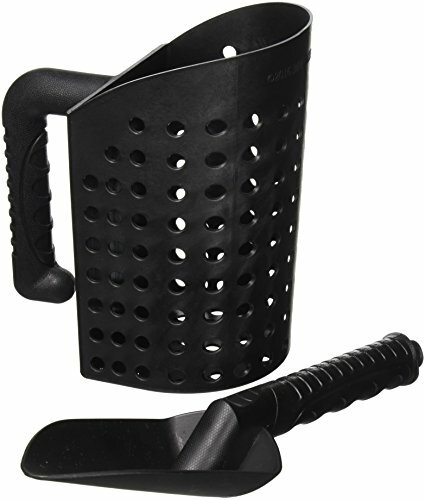 The Evolution Long-handled metal sand scoop is perfect for those that suffer from back problems or aches and those that want to make their metal detecting experience as easy as possible. They are quite expensive and you will need to purchase the shaft separately. They are built of stainless steel and are strengthened with full stainless steel welds so by rights if you buy one you should never have to buy another again. This should last a lifetime. If you’re handy with the tools and good at a little DIY then you could have a go at making your own sand scoop. This, of course, is a great option for those working with a budget who don’t have much money to invest in the hobby. There’s a fantastic step by step guide to making your own DIY sand scoop in the video below. Here are a few beach metal detecting tips that I’ve put together to hopefully help you increase your finds rate, to make your day run smoother and to help you enjoy this wonderful hobby just that little bit more. Another great place to have a scan over with your metal detector is the entrance and exits for the beach. Again if you go beforehand to do a bit of recon you can gain a good idea where these points are by watching how people come on and leave the beach. Try to also look for any walls that people climb over to get onto the beach. Beach detecting is very popular due to the open permit, this means that you will have competition and you will have other detectorists detecting the same beach as you. If you really want to beat the competition to the treasures then you’re going to have to time it right. Sunday evening is a fantastic time to get there after a busy weekend as most detectorists will wait until the following morning. Has there just been a bank holiday? Then get there on a Monday evening or at the crack of dawn on a Tuesday after. Oh and detecting just after a big storm and heavy winds is a great time to get your metal detector on the beach. So don’t miss out. Does the beach have a pier? Many piers have a lot of history behind them considering a lot was built over 100 years ago. Large Rocks, sea walls these were often used by sunbathers as a ready-made windbreaker or for shade. Items also come to rest here when the tide pushes things against them. As previously stated in this guide, only certain metal detectors are efficient on the beach, especially on the wet sand. You’re kind of ok if you’re staying in the dry sand just make sure you turn your sensitivity down a few notches, however, if you’re wanting to metal detect on the wet sand where there are lots of targets to be found you’re going to struggle without the right machine. Not only is this a much quicker and easier way of recovering your targets on the beach, it’s also much safer. In the world we live in people can be very messy and leave behind sharp objects. The last thing you want to be doing is scooping the sand up by hand….what if you find a used needle? This is a possibility. The beach can be a place where drug addicts inject. Stay safe and use a scoop! If you’re heading towards the wet sand then before you begin have a feel of the wet sand. Is it compact? Does your foot sink fast? If there is some kind of resistance then this is a good sign that your targets won’t have sunk too far for you to find. Pay close attention to areas where many rocks & shell or pebbles have gathered, these can be great areas to metal detect because the rocks, shells or pebbles can trap valuables and metal objects among them. What kind of things have been found on the beach? It’s kind of a tough question to answer but there’s only one answer. Everything! That being said some things are more common to find than others on the beach. As I explained earlier finding historic items is probably rarer. Because of the large numbers of people who visit the beach and lose their personal effects, it’s not uncommon for beach detectorists to find gold and silver jewellery like rings, bracelets, necklaces etc or modern coinage. No doubt it’s possible to find coinage from over the years including Victorian, Georgian and Edwardian. There have also been many recordings of Spanish Reales found, Pirate money! However don’t get too excited this hobby requires patience and persistence. You can expect to find a lot of junk while on your beach metal detecting adventures. Don’t forget to do your bit and to remove the junk and bin it! I do hope this has answered any beach metal detecting questions you may have. I’m by no means a pro detectorist if there even is such thing. You have to walk over the good targets to find them so please do remember a lot of the time you aren’t doing anything wrong. You’re going to need a lot of patience while beach metal detecting, most beaches are highly littered with junk. So it’s not uncommon to find 30 junk items to every 1 good find. Keep at it! If you have any questions that I have not covered please feel free to leave a comment below and I will take the time to answer. Or if you yourself have some good advice that you would like to leave or equipment you would like to recommend I’d love to include it in this guide. 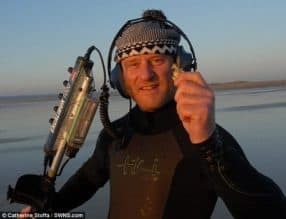 I would really like this beach metal detecting article to help everyone. It’s wonderful tips. Usually I use one of these detector – . It’s a great way to have some fun and if you are lucky enogh to find some valuable metal.